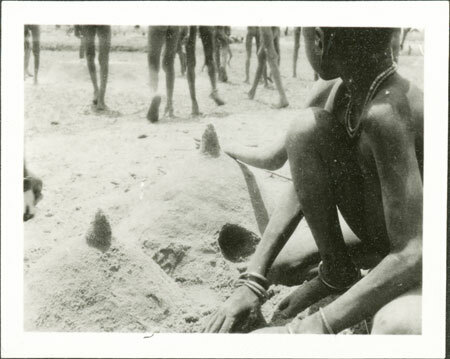 Children making sand cattle byres (luak), complete with entrance way and finial on roof, as part of their play. Nuer children are well known for their making of mud oxen, a number of which are found in the Museum's collection, collected by Evans-Pritchard. Note on print reverse ms pencil - "4 156 "
Morton, Chris. "Nuer children making sand byres" Southern Sudan Project (in development). 03 Jan. 2006. Pitt Rivers Museum. <http://southernsudan.prm.ox.ac.uk/details/1998.346.156.2/>.